For the past two months, more than four dozen volunteers from the U.S. Navy Flight Deck Veterans Group worked steadily to restore an F-14 Tomcat fighter jet parked atop the World War II-era aircraft carrier Yorktown at Patriots Point in Mount Pleasant. Starting in March, the group stripped the retired jet down, fixed its corrosion, gave it a fresh coat of paint and applied new decals to bring it back to its original look. The spruced-up aircraft was unveiled at 1 p.m. this past Saturday at Patriots Point Naval & Maritime Museum. For Deacon and the other volunteers, the project brought back fond memories of their own military careers. Deacon, 59, who retired from the Navy 22 years ago, worked on F-14s during his time in the Navy. The Navy stopped flying the F-14 in September 2006. Deacon said the Tomcat was a formidable fighter. Its maximum speed was 1,544 miles per hour. It was equipped with technology that could track 24 missiles at once and identify the six most dangerous. And the weaponry on the F-14 was able to take out targets 100 miles away. “To this day, there’s nothing that even comes close to it,” Deacon said. 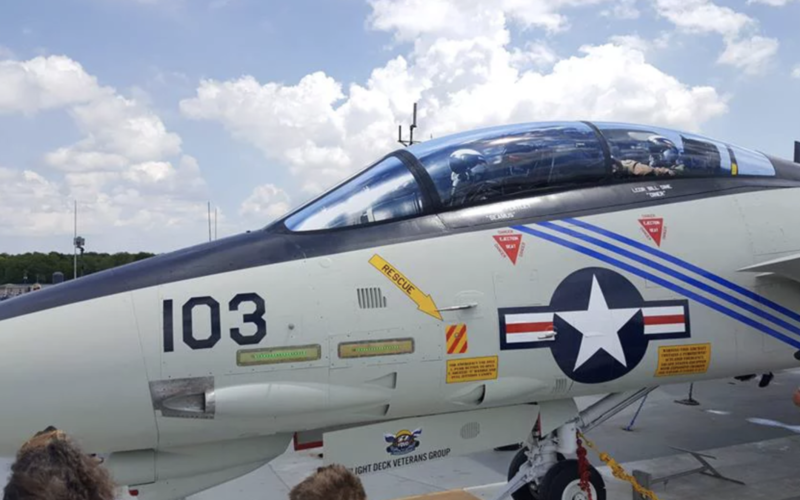 Mac Burdette, executive director of Patriots Point, recalled his reaction to their offer to help give the plane a makeover. “It was quite a surprise when they came to us and said, ‘This is what we’d like to do,’” he said. Deacon said the project helped bring him back years. “Getting back to my younger days and being able to work on these planes is a thrill,” he said. The F-14 rehabilitation crew is going to take a break for the summer and then start work on another aircraft on the Yorktown, Deacon said. Other members of the Navy Flight Deck Veterans Group are working to make old military planes look new again in California, Texas and Florida. “Right now, this is going to be the best-looking one,” Deacon said.